Published: July 20, 2015 at 04:19 p.m. Updated: July 20, 2015 at 05:14 p.m.
We are less than a week away from the start of training camp, which means we're also on the verge of a few important camp battles that will determine the value of several fantasy players you'll want to draft (or avoid) in 2015. Here's 10 competitions you need to watch. As Roger Murtaugh said in "Lethal Weapon 2," picking the eventual lead back in Dallas could equate to winning a "Donald Trump lotto" in fantasy football. The Cowboys have one of the best offensive lines in the NFL, which contributed to the success of DeMarco Murray a season ago. I'm on board with Joseph Randle, who averaged 6.7 yards per carry in 2014 and has youth and potential on his side. However, it wouldn't be a shock to see Darren McFadden open the season as the starter either. 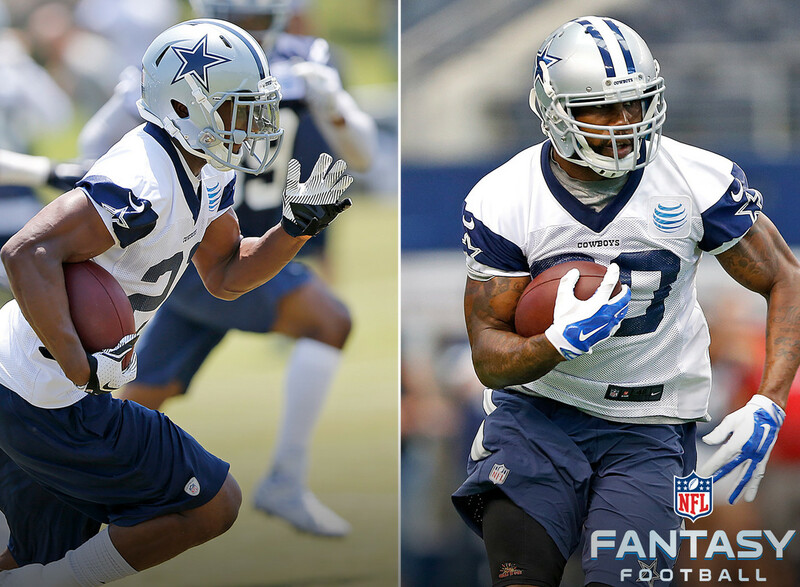 A committee situation is also very possible here, but an impressive camp from either Randle or McFadden will get the fantasy football hype train running on all cylinders. Devonta Freeman has the slight edge in this backfield competition, as he ran with the first-team offense during offseason team activities. However, fantasy fans have to like the sort of upside rookie Tevin Coleman will bring in coordinator Kyle Shanahan's zone-blocking scheme. The Indiana product is a home-run hitter who should emerge into the preferred early-down and goal-line option, even if it isn't right out of the gate. Freeman will see a significant role in the passing game, though, turning this into another shared backfield situation. I'd be targeting Coleman ahead of Freeman, but he shouldn't be drafted as much more than a mid-flex starter. The Lions are expected to open the season with Joique Bell as their lead runner, but how long can he hold it? Coming off Achilles' and knee ailments, his absence in OTAs created a chance for rookie Ameer Abdullah to shine ... and that's exactly what he did. In fact, some Lions beat writers called him "impressive" and expect Abdullah to see "significant minutes this fall." I tend to agree, so much so that I would actually draft Abdullah ahead of Bell based on upside alone. With that said, we are likely to see a committee situation to start 2015. Just don't be surprised when the Nebraska product makes a significant push to start during the season. The departure of Jeremy Maclin (Chiefs) has opened up a tremendous chance for Jordan Matthews to become a more consistent and productive option for fantasy fans in 2015. Of course, it also creates targets for the eventual No. 2 wideout. The favorite for that role is rookie Nelson Agholor, but there's going to be competition in the form of Riley Cooper and Josh Huff. Miles Austin is also in the mix, though I see him as the fourth- or fifth-best option. If Agholor is able to hold off his veteran teammates in camp, he'll become an even more popular fantasy sleeper. Remember, coach Chip Kelly's system will also be near the league lead in offensive plays. Isaiah Crowell is expected to open the season atop the Browns depth chart, but will he be a true featured back? The answer is no. In fact, I'm jumping on the Duke Johnson bandwagon. While I might be pushing him too soon (remember Lamar Miller? ), I do feel like Johnson has the biggest upside in this backfield. What's more, former fantasy superstar and Miami (FL) product Clinton Portis told me he thinks his fellow Hurricane will be the starter by Week 4. Regardless, fantasy fans need to be keeping close tabs on this competition between Crowell, Johnson and Terrance West. The Browns are going to run the football a ton, so opportunities will be there. We're not talking about a return to the days of the Marks Brothers with Clayton and Duper, but there's a lot to like about the Dolphins wideouts this season. The question for fantasy fans surrounds the depth chart, and figuring out who will see the most targets from Ryan Tannehill. DeVante Parker (foot) is expected to be back in time for Week 1 barring setbacks, but he'll be hard pressed to pass Jarvis Landry or Kenny Stills on the depth chart if he misses all of training camp. Landry, who recorded an impressive 84 catches as a rookie, figures to be the first Miami wideout drafted in fantasy leagues. Stills and Parker are both late rounders. Looking back, you don't see a lot of Penn State wideouts finding statistical success at the NFL level. With that said, I'm still high on Allen Robinson. He earned praise in OTAs, and it wouldn't shock me to see him become the first Jacksonville wideout since 2005 to reach the 1,000-yard mark. With that said, Robinson will need to continue his impressive work in training camp to earn the top spot ahead of both Marqise Lee and Allen Hurns. He also needs to avoid injuries, which derailed him from having a much better rookie campaign. If you can land him as a No. 3 fantasy wideout, Robinson could bear fruit and become a quality draft bargain for owners. The Tennessee backfield was one to watch last preseason, and I liked Bishop Sankey to earn the lead-back duties. While he did start nine games, the Washington product didn't come close to meeting expectations for fantasy fans. The situation is different now, as Sankey is the favorite to open 2015 as the starter. He'll have to hold off rookie David Cobb in training camp, however. In fact, some Titans writers suggest the Minnesota product will pass Sankey and lead the team in carries. Neither back has a high ADP (Sankey is Round 15), but I'd rather take a flier on Cobb after watching tape of Sankey and now being skeptical of his NFL potential. If you read the reports out of Tampa Bay, this isn't much of a competition ... Doug Martin worked as the starter all offseason and is the clear-cut favorite to open this season atop the team's depth chart. Of course, Charles Sims could also push for more work if Martin can't improve on the 3.7 yards-per-carry average he recorded in 2014. Sims should be involved in the pass attack regardless, so a partial committee scenario is likely under new offensive coordinator Dirk Koetter. If the Boise State product isn't able to reclaim at least some of his 2012 form, however, Buccaneers coaches could give Sims a legit shot to push himself up the depth chart. The departure of veteran wideout Torrey Smith leaves a gaping hole in the Ravens' starting offensive lineup. While Steve Smith Sr. will open the season as the team's No. 1 wideout, the trio of Breshard Perriman, Kamar Aiken and Marlon Brown are all in the mix for the second spot on the depth chart. The best bet to earn that role is Perriman, despite the fact that he suffered through a major case of the "dropsies" during his collegiate career. If he can improve on those mental mistakes, Perriman could be a nice value based on his 11th-round ADP on NFL.com. Watch Brown, though, as he scored seven touchdowns as a rookie and has some red-zone appeal.